Why do u think jango just kept trying to shoot mace windu instead of just flying off? Because he had no tactical mindset, probably freaked out, (which would never happen to Boba) and got killed for it. Case-in-point, Jango's an idiot. that plus the Reek damaged Jango's jetpack. if u notice, right before he is be-headed, his jetpack shoots sparks out, as if he intended to escape in the nick of time. Jango was absolutly going to die, so he might aswell fire. ever wish you would have dealt with a situation a little differently?...so does jango. Jango just lost his head in a stressful situation. He should have thought through his choices more clearly and kept a strong head on his shoulders. He got ahead of himself and thought he could take Mace down quick instead of dealing with the situation correctly. NO NO NO!!!!!!!!!!! Listen here is why jango died: Lucas didn't want jango in EP3 and had to get rid of him and mace didn't do much yet in EP2 so Lucas had him kill jango. Yes jango's jet pack wasn't working you can see (if you look close) that he trys to jet but it falters and his head gets knoct off. THe real qustion should be "Why dosn't jango just flame mace INSTED of shooting at him!" Which I have an answer for too: same as above + he used it once in EP2 allredy and no one likes to see something cool twice in a movie (just watch a action film and you'll see what I mean). Case-in-point, Jango's an idiot... STOP picking on JANGO!!!!!!! As I've said he's not all that bad and w/out Jango THERE IS NO BOBA! oh and Boba did die a even more pathetic death I mean it's gotta hurt to be killed on accident by a blind smugler who was just your merchandice. don't get me wrong I like boba better than jango but jango's no "Idiot" Yautja. oh and Boba did die a even more pathetic death I mean it's gotta hurt to be killed by a blind smugler who was just your merchandice on accident. It was never proved that Boba died in the Sarlacc. It was just assumed that he died when he fell into it. We did not actually see him die. This is why he was able to escape in the extended universe books. If Boba had been seen to have been killed (like Jango was) then it would not have mattered how much liked he was, he would not have been able to have come back for the books. The only times he would have been in the extended universe books would have been pre return of the Jedi. As for the question, Jango carried on shooting at Mace because he did not realise his jetpack was dead. As it had been mentioned by Fett_II, you see him trying to get it to work shortly before he gets killed. THe real qustion should be "Why dosn't jango jest flame mace INSTED of shooting at him!" Which I have an answer for too: same as above + he used it once in EP3 allredy and no one likes to see something cool twice in a movie (just watch a action film and you'll see what I mean). Jango completely stole the spotlight from Boba. Now there is not one Fett to rule the bounty trade, but two. And one of them should definitely not be there. I'll let you figure out who. Oh ok your one of "THOSE" I see why you're mad, but why lucas even made jango was to do what boba didn't do in the movies, which was anything. ...But this is why you hate jango and I say that if we are "supposed to talk about it as if it was real" then w/out jango there is no boba. Yah And I'm going to wright a book about how it was oly a CLONE of jango and thats why he didn't jet or use his flame-thrower. What I'm saying is that Boba only lived is cu'z some guy at dark horse liked him and said "I think he should live and get out" I LIKE the fact that he got out and that he is just as cool but it's only cu'z someone wrote a book about it. I was fine with not knowing Boba's backstory. No, I was more than fine. It made his character much better. 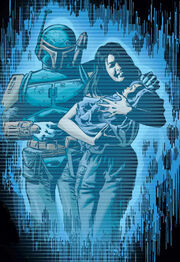 "When Ailyn was two years old, Fett walked out on the family, leaving Sintas to care for the child alone". They make Boba a JERK! I hope I don't sound to attacking but those are the facts. Look I have no real problem with Jango as many people on this board do. But... Your reasoning here is very flawed Alo. I agree with Yautja that you can't use the old, "He had to die because..." excuse. Out of universe explanations make no sense here since we already take for granted that this stuff is "real". And Darkhorse wasn't the first one to pull boba from the Sarlacc. And why haven't any writers taken the initiative to bring back Jango? Maybe because he just doesn't live up to Boba's standards. And don't give me any of that "Boba would have to live up to Jango's standards" or "No Boba without Jango". The truth is that there is no Jango without Boba. But if you want to think in that regard, Jango didn't have to be anything more than a memory in the movies. He wasn't necessary to the plot and he didn't have to be there, He was only there because Boba was such a popular character. Although now you may not believe it, it is true that I have nothing against Jango. I still hold that his armor looks cooler than Boba's. But it is completely possible that people can in fact aknowledge that Jango exists without liking him Alo. It is not necessary to like a character just because he is Boba's dad. THats the point WE HATE IT and THEY HATE JANGO and if lucas didn't make boba's backround story someone like THAT Would have. I'm not saying you HAVE to like jango just don't diss him all the time. That is the same with every fictional character. Someone decides whether they should live or die. I was also happy that there was an opportunity for Boba to survive what happened to him in return of the Jedi. LOL I am the one percent (Hehe I like being different) but I like the background story with Boba and him having a family. I am not impressed with him leaving his wife and small child but it is interesting to read and it adds another dimension. Boba has a legacy and someone to pass his skills onto. I am really looking forward to reading more about what Boba and Mirta are up to. Fetterthanyou :And don't give me any of that "Boba would have to live up to Jango's standards" or "No Boba without Jango". And why haven't any writers taken the initiative to bring back Jango? Maybe because he just doesn't live up to Boba's standards. And because we saw Jango die. That cannot be disputed in any way shape or form. Actually it can be as Alo said, it could be some stupid explanation like it was another clone or something. But yes, his death was much more definative than falling into a Sarlaac. The Yautja, I think I know how you felt on the Master Chief form lol. It means she feels that everyone is against her. But we weren't against Yautja... he was just trying to keep it at a higher level of argument, like i was. He was probably freaked out and started shooting like crazy. I think Jango got caught up in the frenzy and just didn't think, he followed his instincts and they led him astray. As for bringing him back from the dead, I haven't heard of a cure for decapitation.